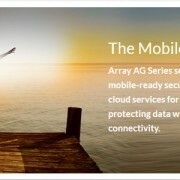 Array Networks introduces DirectDesktop Solution for iPad – Throughwave (Thailand) Co.,Ltd. May 26, 2010 – Array Networks, the Application Delivery and SSL-VPN technology leader, introduces the DesktopDirect Solution for iPad, which lets the users to work on their PCs at the offices from anywhere over the internet via iPads, makes them working with higher mobility on the virtual office environment. DesktopDirect for iPad is developed to solve 2 problems. First, to enable the usage of enterprise applications from anywhere and anytime. While security, as the second problems, is handle by the Array SPX appliance. This way, everyone can works on their PCs from anywhere at anytime with the acceptable securty level by using the iPads. This makes everyone work more effective and makes the businesses more professional. Moreover, not only the business guys gain profit from this solution, the IT department also gains a lot of profit from it. DirectDesktop allows one user to have the authority to access many PCs, which lets the IT guys easier to monitor, manage an maintenance the whole system remotely.